The best way to avoid adware applications is to refrain from installing unfamiliar freeware on your computer. Or, before you install something like Bestlyrics on your PC, you should search for comments and opinions about it online. After all, if you were to judge from its official website at bestlyrics.co, the application may seem like a sophisticated browser add-on that enhances your video viewing experience on YouTube. However, the truth is that Bestlyrics is more troublesome than useful, and computer security experts strongly recommend removing Bestlyrics from your PC as soon as possible. BestLyrics will find any lyrics on YouTube and display them alongside the music video you listen to. That seems to be highly useful, especially if you are an avid YouTube user, not to mention that Bestlyrics is compatible with Google Chrome, Mozilla Firefox and Internet Explorer web browsers. However, lyrics are not the only thing this application comes with, and the other part of its payload is exactly the thing one should be worried about. The thing is that rather than being a browser extension, first and foremost Bestlyrics is an adware program. As such, it falls into the same group as the rest of the Lyrics adware applications such as LyricsKid, LyricStar, Lyrics Monkey and so on. Although all of them do display lyrics next to your YouTube video, they also display a lot of commercial advertisements that may impede your browsing process. Not to mention that Bestlyrics can also come bundled with Conduit toolbars, so whenever you install a freeware application downloaded from a third party website, you need to be attentive enough to notice any additional applications about to be installed as well. Although Bestlyrics is not a malicious computer infection, it may expose you to a number of computer security risks. 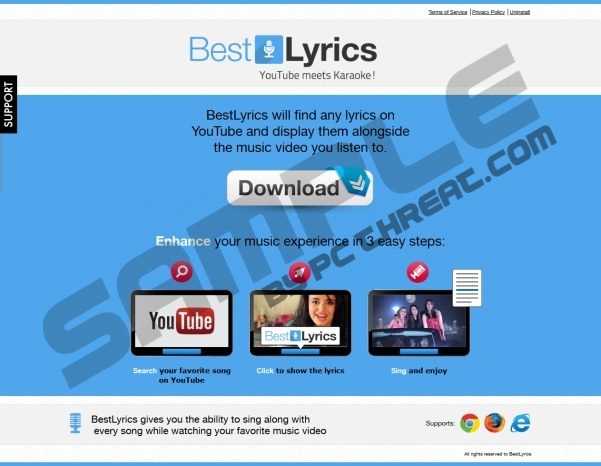 The main problem regarding Bestlyrics is that it employs a third party advertising network to generate the pop-ups. Hence, it does not review the pop-up content, and if Bestlyrics is exploited by a malicious party for malware distribution, sooner or later you could get infected with dangerous computer threat. To avoid that, you need to delete Bestlyrics from your PC, and that can be easily done via Control Panel. However, manual removal may not be enough to ensure the safety of your PC. Therefore, do scan your system with SpyHunter free scanner and do invest in a computer security tool if need be. After all, your PC safety should be your utmost priority. Click Uninstall a program and remove BestLyrics. Go to Uninstall a program and remove BestLyrics. Select Add or remove programs and uninstall BestLyrics. Quick & tested solution for Bestlyrics removal.